Intersting facts about the "Strength" Attribute. Ambrosia started a topic Intersting facts about the "Strength" Attribute. Remember those Strength tables you find in the corebooks under the 'Physical Feats' sections, that show what level in the Strength attribute let you lift what kind of weight? Out of simple curiosity I decided to plot those on a graph. Mostly because, at least in my mind, it's always been hard to get a good grip on the relation between the different levels of Strength. And this is the (rather interesting) result. Rightclick -> view image for a better scale. * The Strength increases between the individual levels of human strength vary roughly between 56% and whopping 225% increases in strength - with the biggest one being right at the start, between Strength 1 and 2. * The increase between Strength 4 and 5 exactly equals the whole of Strength 3. Something to keep in mind. * ...and go crazy. The steps between 8 and 9, and 9 and 10 are about the scale of Strength 3 (A little higher, really). * Then though, we suddenly proceed in a linear fashion, with every single Strength increase of level after 10 equaling the total Strength of 8(!). 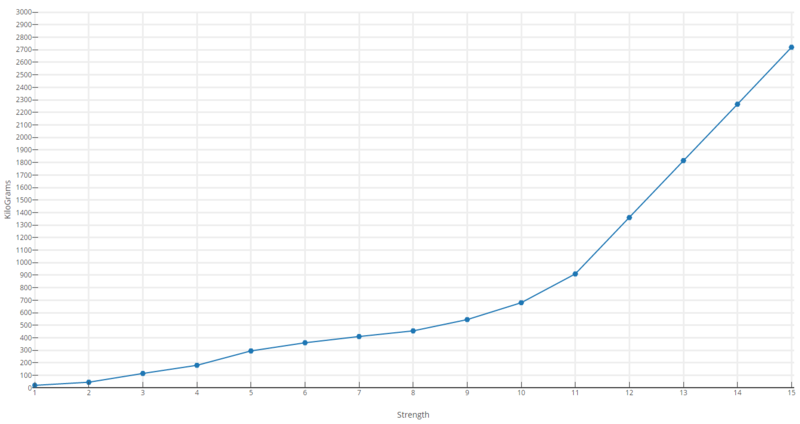 Or to put it different: Every single Strength increase after 11 roughly equals +150% of the strongest a human can get. It all doesn't feel that way when you usually handle the Strength attribute, eh? Well, that's because the main thing the Strength attribute gets used for in WoD, or at least the thing most memorizable by players, is combat - where things scale very linear fashion all of a sudden, with each level of Strength giving us an additional die in melee/brawl. It's worth keeping above curve in mind when it comes to actual strength and making a character - of note being especially the sudden dip in relative increases between 5 and 8, and the insanity that follows 11. Last edited by Ambrosia; 08-24-2017, 12:17 PM. The differences between ranks 1-5 of any trait is never equal. 1 is below average, 2 is average, and collectively 3-5 are above average. If you map that onto your standard bell curve, they'll take up very different portions of that graph. There shouldn't be an equal progression. Probably any trait 2 represents one standard deviation of the bell curve on both sides of the center. Then trait 1 represents everything to the left of that, and the figure given is simply an average of that range. Traits 3 through 5 represent everything right of that, meaning as you progress from 3 to 4 and 4 to 5, each step should represent a significant increase. That is normal human range. Anything more than that is because of supernatural powers. We're outside the bell curve at that point. So I am not surprised the game keeps progression slow after that - it may want to have vampire and werewolves be stronger than normal humans, but it wants to avoid superhero comic book levels of strength and keep it grounded into what we see in classic horror movies and literature. Once you get to trait 11 and more, at that point it should be beyond any characters of the player types. Those tend to be reserved for truly outlandish creatures which have super powered strength compared to humans. So I am not surprised it escalates so much. So the progression between 1 to 15 shouldn't be equal, but reflect the needs of the game at each level. It seems for the most part your chart reflects that, so good on the designers. It's something that can be easily houseruled using consistent multiple. Some might find that smacks of D&D-isms though.